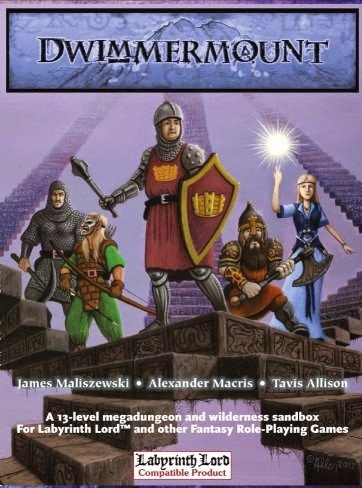 OSR News and Reviews: Woohoo! Dwimmermount Finished! I backed this Kickstarter a couple of years ago (28 months to be precise). Originally the target date for release was August 2012. But now in August 2014, it's finally done, thanks to the people at Autarch, with the final PDF going out to backers today, and the print versions shipping this week (hopefully, presumably they are using print on demand for it, so it shouldn't take more than a week or two). Despite the delays, I've been pretty happy with it. We did have a word manuscript from James done in about November of 2012. But then basically nothing happened for a year after that, before Autarch finally picked it up. As to the quality, I think it's excellent. The rant about the giant rats and 2000 coppers was overwrought, I thought. Barrowmaze and Stonehell Dungeon get praised, yet they have more rooms with rats than Dwimmermount does. Heck, probably half of Barrowmaze is rooms with rats. (Okay, hyperbole, but it's got to be at least 10 rooms with rats).